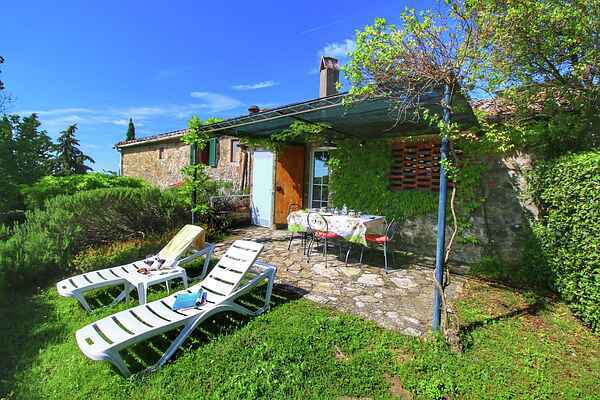 This agritourismo consists of a small group of rustic houses 7 km from Siena among the Chianti Classico vineyards. It is a beautiful place to escape the pressures of the city and to relax amidst the natural surroundings. Apartment Ovile is a charming apartment with a number of pieces of antique furniture. The apartment has a covered terrace. The friendly retired owners passionately produce the wine aged in wooden barrels and top quality olive oil on their 47 hectares. The wine, vin santo, olive oil and vegetables can be purchased on site. The beautiful landscape, the peace and the nearness of the Tuscan art cities make this agritourismo a beautiful place to spend your holiday. Internet wifi only available in common areas.